Natural & Artificial Flavors, Silicon Dioxide, Calcium Silicate, Lecithin, Sucralose, FD&C Yellow #5, Acesulfame Potassium, FD&C Blue #2. Water, Amino Acid Blend [Pepform® BCAA Peptides (Hydrolyzed Whey Protein Isolate, L-Leucine, L-Isoleucine, L-Valine), L-Alanine, L-Lysine HCL, Glycine, Taurine, Pepform® Citrulline Peptides (L-Citrulline, Hydrolyzed Whey Protein Isolate)], Natural And Artificial Flavor, Phosphoric Acid, Malic Acid, Potassium Sorbate, Potassium Benzoate (as preservatives), Salt, Propylene Glycol Alginate, Sucralose, Potassium Chloride, Acesulfame Potassium, Red 40, Blue 1. Mix 1 scoop with 6-8 fl oz of cold water or any beverage or your choice before, during, or after your workout. For maximum performance consume a second serving. Water, Amino Acid Blend [Pepform® BCAA Peptides (Hydrolyzed Whey Protein Isolate, L-Leucine, L-Isoleucine, L-Valine), L-Alanine, L-Lysine HCL, Glycine, Taurine, Pepform® Citrulline Peptides (L-Citrulline, Hydrolyzed Whey Protein Isolate)], Malic Acid, Natural And Artificial Flavor, Phosphoric Acid, Potassium Sorbate, Potassium Benzoate (as preservatives), Salt, Propylene Glycol Alginate, Tartaric Acid, Sucralose, Acesulfame Potassium, Potassium Chloride, Red 40. As a dietary supplement, mix 1 level scoop with 6-8 oz. of cold water or any beverage of your choice before, during or after your workout. For best results consume at least 2 servings per day. To maximize the effects of AMINOx™ consume 120 oz. of water per day and a diet that is rich in protein and carbohydrates. Your body chemistry and weight will determine how long it takes to experience the effect of AMINOx™. AMINOx™ begins to induce its maximum effects in weeks 3-12. After 12 weeks of use, discontinue for at least 4 weeks. Natural & Artificial Flavor, Inulin, Tea Extract, Potassium Bicarbonate, Caffeine (from Tea and/or Coffee Bean), Silicon Dioxide, Sucralose, Quillaia Extract, Soy Lecithin, Acesulfame Potassium. Inulin, Natural & Artificial Flavor, Tea Extract, Potassium Bicarbonate, Caffeine (from Tea and/or Coffee Bean), Silicon Dioxide, Sucralose, Quillaia Extract, Soy Lecithin, Acesulfame Potassium. Natural & Artificial Flavor, Inulin, Tea Extract, Potassium Bicarbonate, Caffeine (from Tea and/or Coffee Bean), Silicon Dioxide, Acesulfame Potassium, Quillaia Extract, Soy Lecithin, Sucralose. Natural and Artificial Flavor, Silicon Dioxide, Lecithin, Sucralose, Beet Juice Powder (color), Red 40, Acesulfame Potassium. Natural and Artificial Flavor, Sucralose, Lecithin, Silicon Dioxide, Blue 2, Red 40. Natural and Artificial Flavor, Silicon Dioxide, Calcium Silicate, Lecithin, Sucralose, Yellow 5, Acesulfame Potassium, Blue 2. Natural and Artificial Flavor, Silicon Dioxide, Lecithin, Sucralose, Acesulfame Potassium, Yellow 5. 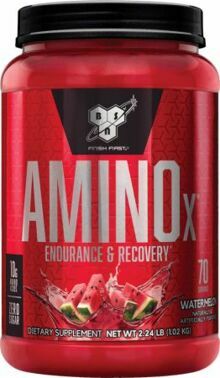 BSN's Amino-X faces heavy scrutiny after a few discrepancies were seen between the U.S. and Canadian Supplement Facts, leading to questions in the US. 10g of Micronized Anti-Catabolic Amino Acids per Serving! Stack with Nitrix, N.O.-Xplode, Syntha-6 and TrueMass for maximum physique and performance impact. What Puts AMINOx Above the Competition?